“The Smurfs 2”is a modern hybrid live action/animated equivalent of “The Three Stooges” meet “The Little Rascals” but without any of the intelligence and irony those series exhibited. In this sequel, the Smurfs must travel to Paris to rescue Smurfette from the clutches of the Naughties. The film has the benefit of preparing today’s kids for the more elaborate cross-merchandising of comic book heroes and films when they become adults. From Sony. “The Mortal Instruments: City of Bones”is a lackluster fantasy adventure with something old, something new, something borrowed, something blue from every similar franchise that came before it. This forgettable outing follows a young girl who one day discovers she’s descended from a long line of demon-slayers and must travel to an alternate New York to fight the evil forces. Based on the best-selling book series by Cassandra Clare. From Sony. Also due this week: “The Wolverine,” which, unfortunately, hadn’t arrived in time for review. At the top of this week’s list of top bets is a documentary on an icon from the past and a mockumentary on icons from the nonexistent past. 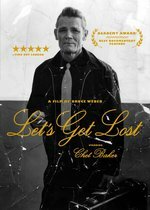 “Let’s Get Lost” is also part of a four-disc set of Weber’s work, “Bruce Weber: The Film Collection” (2013), which brings together the most celebrated documentaries by the internationally praised photographer and filmmaker. In addition to the Chet Baker docu the collector’s set includes “Broken Noses” (1987) (about a youth boxing club near Portland, Oregon), “Chop Suey” (2001) (an homage to Weber’s favorite things, including photography and classic movies) and “A Letter to True” (2004), which centers on his dogs, a family of gorgeous golden retrievers. This box set gives art enthusiasts a look back at one of photography’s greatest talents. Includes a 32-page booklet of Weber’s photographs. Also from Docurama … “All You Need Is Cash” just has to be the greatest mockumentary of all time. 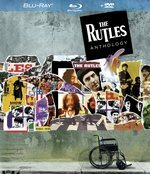 The legendary 1978 parody of The Beatles from Monty Python founding member Eric Idle makes it’s Blu-ray debut this week as part of the “The Rutles: Anthology,” which is being released by Video Services Corp in both Blu-ray and Blu-ray/DVD combo sets. Originally introduced by Idle in his post-Python BBC satire “Rutland Weekend Television,” “All You Need Is Cash” was brought to prime time in a 1978 TV special, produced by “Saturday Night Live’s” Lorne Michaels, directed by Gary Weis and featuring the original Not Ready for Prime Time Players. The film follows the epic rise and fall of the tight-trousered lads from Rutland as they hit the top of the pops and the heights of absurdity. Bonus features on the Blu-ray/DVD combo pack include a new interview with Eric Idle, 2004’s “The Rutles 2: Can’t Buy Me Lunch” (in which celebrity artists, actors and musicians came forward to revisit and reflect on how The Rutles influenced them and the cultural landscape. Guest stars included George Harrison, Mick Jagger, Bianca Jagger, Bill Murray, John Belushi, Dan Aykroyd, Gilda Radner, Lorne Michaels, Carrie Fisher, Michael Palin, Paul Simon, Gary Shandling, David Bowie, Ron Wood, Steve Martin, Conan O’Brien, Salman Rushdie, Jimmy Fallon, Robin Williams and many more) and the original “Rutland Weekend” sketch from “Saturday Night Live” that aired in 1976 when Idle hosted the late night series. Cheeky, wild and wonderful — with music and songmanship that — when you close your eyes — sounds just like the Fab Four. 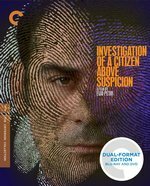 Other best bets: The provocative Italian filmmaker Elio Petri’s most internationally acclaimed work is the remarkable, visceral, Oscar-winning thriller “Investigation of a Citizen Above Suspicion” (1970). Petri maintains a tricky balance between absurdity and realism in telling the Kafkaesque tale of a Roman police inspector (Gian Maria Volonte, in a commanding performance) investigating a heinous crime — which he committed himself. Both a penetrating character study and a disturbing commentary on the draconian crackdowns by the Italian government in the late 1960s and early 70s, this kinetic portrait of surreal bureaucracy is a perversely pleasurable rendering of controlled chaos. In a new 4K digital restoration by the Film Foundation, with uncompressed monaural soundtrack on the Blu-ray … “Nashville”(1975), a cornerstone of 1970s American moviemaking from Robert Altman, is a panoramic view of the country’s political and entertainment landscapes, set in the nation’s music capital. “Nashville” weaves together the stories of 24 characters — from country music star to wannabe to reporter to waitress — into a cinematic tapestry that is equal parts comedy, tragedy, and musical. Many members of the astonishing cast wrote and performed their own songs live on location, which lends another layer to the film’s quirky authenticity. Altman’s ability to get to the heart of American life via its eccentric byways was never put to better use than in this grand, rollicking triumph, which barrels forward to an unforgettable conclusion. New 2K digital film restoration, with 5.1 surround DTS-HD Master Audio soundtrack on the Blu-ray. Both are in Blu-ray/DVD Dual Format Editions from The Criterion Collection. Blu-ray specials: “Argo Extended Edition Blu-ray” (2012) includes an additional nine minutes of footage, new extras and collectible memorabilia for fans of the Ben Afleck film: an “Argo” one-sheet poster, a map of Tehran, a reproduction of Tony Mendez’s CIA ID card, a 40-page book premium featuring behind the scenes photos, production notes, bios and more. Extras include new features “Argo Declassified,” in which Tony Mendez’s daring operation gets honored as part of the CIA’s 50th anniversary; “Ben Affleck’s Balancing Act” of humor, politics, Hollywood and international intrigue; “Argo F*ck Yourself,” in which Ben Affleck leads an all-star review of “Argo’s” classic line. A fun-filled collection, $49.99 from Warner … “Anchorman: The Legend of Ron Burgundy — The “Rich Mahogany” Edition Blu-ray” (2004) is a two-disc set with three versions of the film (that stars Will Ferrell, Steve Carrell, Paul Rudd, Christina Applegate and Fred Willard) — the theatrical version, an unrated version and “Wake Up, Ron Burgundy: The Lost Movie” — just in time for the theatrical release of “Anchorman: The Legend Continues” on December 20. 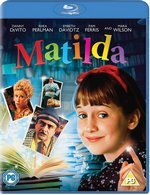 From Paramount … An overlooked comedy classic is “Matilda” (1996), directed by Danny DeVito and starring Mara Wilson, Danny DeVito, Rhea Perlman, Embeth Davidtz, Aileen Quinn and Paul Reubens, making its Blu-ray debut this week. Based on the novel by Roald Dahl, “Matilda” tells the story of a super-smart little girl (Wilson) who’s woefully misunderstood by her parents (DeVito, Perlman), her brother, and an evil school principal. With the help of her telekinetic powers, along with a brave best friend and a wonderful teacher (Davidtz), Matilda discovers she doesn’t have to get mad to get even. Extras include a new featurette, “Afternoon Tea, A Very Magical Matilda Reunion,” bringing the entire cast back together 17 years after the original filming of the movie. Shot exclusively for the Blu-ray, it captures the cast reliving the memories and magic of making the film during an afternoon tea party at director-star Danny DeVito’s private Beverly Hills home. 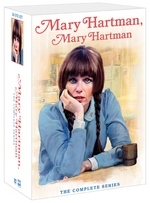 Also includes four previously released featurettes: “Matilda’s Movie Magic!” that explores the film’s stunts and special effects with DeVito, “A Children’s Guide to Good Manners” of lessons in etiquette humorously demonstrated with scenes from the film, “Escape to the Library” with a special reading by the book author’s daughter, and “My Movie About Making Matilda” by Wilson. From Sony.